Notes: The Hare's Ear Nymph is used widely throughout the world having many variations. No one knows with certainty who originally designed the fly but it is believed that Frederick Helford popularized the pattern in the late 1880s as a dry fly with upright Duck Quill wings and Brown and Grizzly hackles. 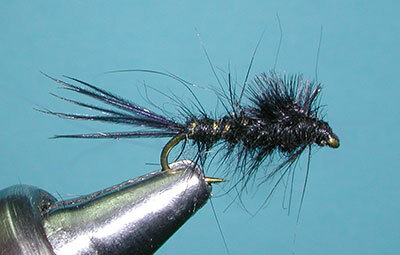 The nymph pattern may go back to earlier years of Izaak Walton. The Hare's Ear Nymph is known as a generic nymph in that it represents many mayfly and caddis nymphs and, therefore, is often used as a searching pattern. Its shaggy appearance resembles many species of nymphs when they shed their skins or shucks as they progress into the next stage of their life. The occasional long hair coming from the body will assist fooling the trout that your fly is alive as the it moves in the water.The more scruffy this fly is, the better it is at catching fish. Many different colors are used but, primarily in the Sierras, we use natural, tan, brown, and olive. It can be fished either weighted or unweighted. The Hare's Mask is the traditional source for the dubbing. The tail is made of guard hairs that are clipped from the area between the eyes of the mask. The underfur is removed by pinching tightly to the guard hairs, keeping them relatively even, and gently pulling away the underfur. The abdomen is made up of hares fur from the cheeks of the mask which is softer and a lighter color than other areas of the mask. This area also tends to have less unruly guard hairs. The thorax is meant to be shaggy and buggy, so I find the best fur to be located on the forehead of the mask. Often the forehead will have darker hair as well. Both the abdomen and thorax dubbing fur should be blended separately prior to tying the pattern. There are a number of commercial dubbing mixes available but often they use rabbit body fur, not Hare's mask. Some of these dubbings will also incorporate Antron, Poly, and other materials. The ribbing is often Gold Oval tinsel but, on the smaller sizes, a fine gold wire might work better. This ribbing gives the pattern it's acronym, GRHE (Gold Ribbed Hares Ear) which you'll often see posted. Use of a gold bead was a new variation when the beads became available during the 1980's. 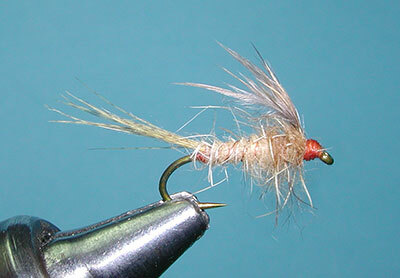 Another variation, you will often see is the use of Pheasant Tail fibers, grouse, or hackle fibers for the tail. The GRHE variation also incorporates a wingcase of mottled Turkey but some variations will use Peacock Herl, Pheasant Tail, or Mylar. Utilizing rubber legs has also been a popular varitation to the nymph. 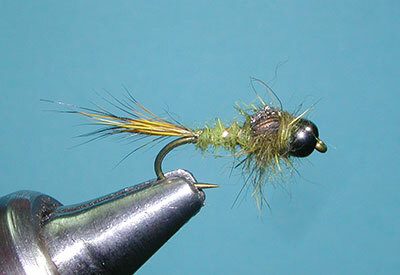 If the fly is greased, it floats and provides an excellent imitation of large, hatching mayflies and caddis fly pupae. 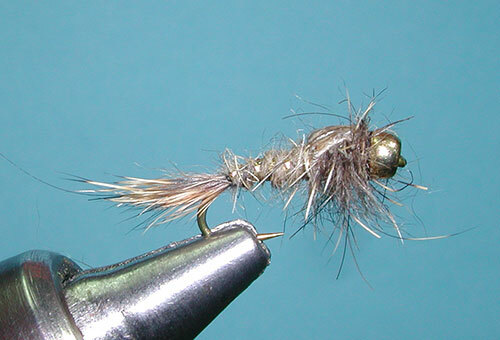 The most common method of fishing this popular fly is on a dead drift. The nymph is cast upstream and allowed to drift within the current. This is a most effective short-range technique and takes are usually seen as a splash at the surface. The Gold Ribbed Hare's Ear has also proven it's effectiveness in lakes. Fished very slowly near the bed of the lake, it is particularly attractive to brown trout. 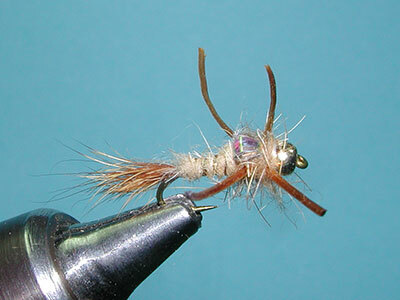 Guy Jeans of Kern River Troutfitter's came up with an excellent variation on the Hare's Ear with his Kern Emerger in 2004. It has it's own page within the flybox.